This is my first month joining the Improv Cooking Challenge. What is it you ask? 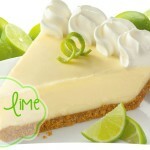 Sheryl at Lady Behind the Curtain chooses 2 ingredients and then you have to create a dish using those two ingredients. This month, we are talking caramel and apples! I knew I was going to take those two ingredients and create a Caramel Apple Cheesecake. I love blessing people with my cooking. Anytime I can bake something for a friend or loved one, I am in the kitchen going to town! This cheesecake was made for a friend of ours who loves caramel and apples. Normally he asks for my Butterfinger cake, but this year he wanted something different. 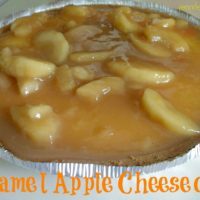 He requested a Caramel Apple Cheesecake. . .and that is exactly what he got! Reserve 3/4 cup of the apple filling; set aside. Spoon the remaining filling into the crust. Beat together the cream cheese, sugar, and vanilla until smooth. Add the eggs and mix well. Pour this over the pie filling. Bake for 30 to 35 minutes, or until the center of the cake is set. Cool to room temperature. Mix the reserved pie filling and caramel topping in a small saucepan and heat for about 1 minute, or until spreadable. Spoon the apple-caramel mixture over the top of the cheesecake and spread evenly. Refrigerate the cake until ready to serve. Check out the Improv Cooking Challenge to get yourself involved in a great way to learn to cook with new ingredients! Wow – that looks good! Thank you so much for sharing at Grandmother Wren's. 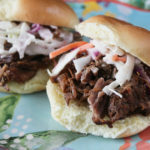 With recipes like this one to share, I hope you'll link in often! 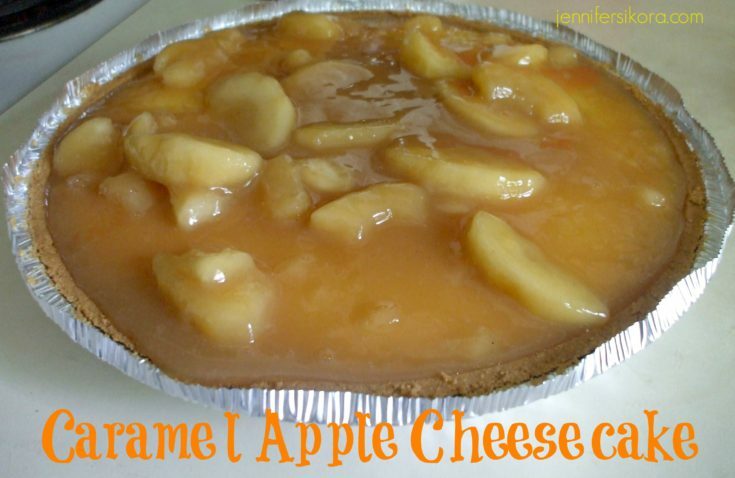 That sounds just lovely – caramel and apples make such a great combination and to put them in cheesecake – yummy! Thanks for sharing your recipe. Looks very yummy. My son never wants BD cake either, its always something different. I so love cheesecake. It's very near and dear to me. This looks heavenly! Thanks! It sounds really good. All the flavors are a great combination. My hubby will be all over this one! 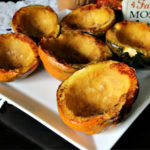 Thanks for linking to Tuesday Tastes! Polls just opened for the People's Choice Award! 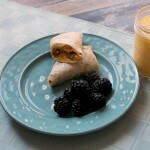 Stop by and and vote when you get a chance -just click on your fav recipe! Sounds delicious and looks great too. Yum! And what a sweet thing to do for someone else! I love cheesecake! Yours look very good. Great idea!! I never would have thought to put apple pie filling on a cheesecake! I love it! Perfect for this month’s challenge!